TEAM NANCY is named for two Nancys. Their stories put in sharp relief why we're asking you to help raise funds for lung cancer research. The first is Nancy Schoch, who died of lung cancer in 2001, less than 5 months after her Stage 4 diagnosis. 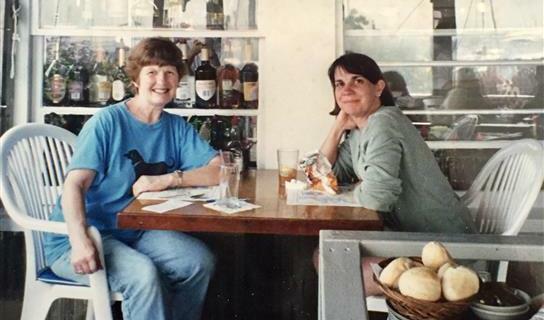 Nancy is on the left in the photo below, at one of the last times she and her sister Deborah went out for lunch. Deborah, a Team Nancy co-founder, later benefited from research into early detection when her own LC was detected at Stage I. The second Nancy is Nancy Huang, best friend of team co-founder Monica Sena, diagnosed nearly eight years ago, also at Stage 4. She is thriving after cutting-edge immunotherapy research trials at UCLA. That meant she has watched her daughter Nicole enter high school. Nancy is shown below with Monica. You can also find her at the far left in the team photo above, taken at the end of our successful 2018 5K in San Dimas, Calif. Nicole (bottom row, second from right) brought her friends and is helping recruit more young people for our 2019 team. 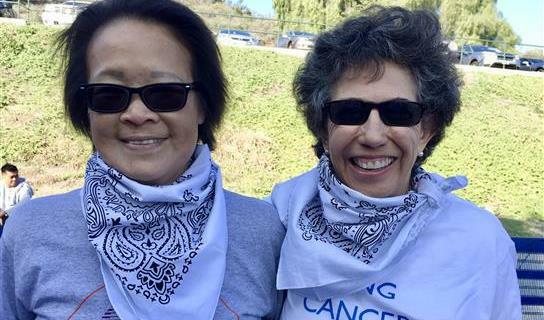 Several of our 2018 team members are lung cancer survivors who have benefited mightily from research breakthroughs. Please join TEAM NANCY by attending the Feb. 10, 2019, 5K run/walk or donating to help fund more research and save more lives. Nancy Huang and Monica Sena, 2016 Next Step is the Cure 5K. Here's to Deborah and Team Nancy! You are an amazing warrior-survivor! Keep up the good fight and advocacy! Good luck and best wishes Feb. 10! Thank you Deborah, Monica and all of Team Nancy for your dedicated work supporting finding a cure for this terrible disease.